A cleft lip and/or palate is the most common craniofacial abnormality, which means problems to do with the skull and face. A cleft lip can range from a little notch in the coloured part of the lip to a complete separation of the upper lip which can extend up and into the nose. This can affect one side of the mouth (unilateral) or both sides (bilateral), and can be complete (meaning the cleft goes up into the nose) or incomplete. A cleft lip can also affect the gum where the teeth come through. Again, this can range from a small notch to a complete separation of the gum into two parts. A cleft palate is a gap in the roof of the mouth. The back of the palate (towards the throat) is called the soft palate, and the front (towards the lips) is called the hard palate. A cleft can affect the soft palate or both the soft and hard palate. Sometimes a baby with a cleft palate may have a small lower jaw (mandible) and a few babies with this combination may have difficulties with breathing. This condition may be identified as Pierre Robin Sequence. You can have a cleft lip, a cleft palate, or a cleft lip and palate. A cleft palate by itself is often called an isolated cleft palate. 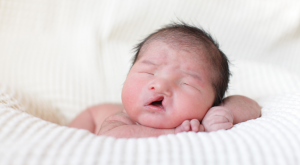 No one knows exactly what causes a cleft. Research tells us it’s often caused by a combination of different genetic and environmental factors. Sometimes a cleft is caused by part of a ‘syndrome’, which is when lots of different symptoms happen together. If you want to find out more about what caused your or your child’s cleft, the Clinical Geneticist in your Cleft Team might be able to help you. How many people have a cleft? Around one in 700 babies are born with a cleft around the world. Cleft Teams made up of a number of specialists from surgeons to speech therapists are provided to deliver the best possible care for people born with a cleft, from infancy through to adulthood. Surgery is needed to close the gap left by the cleft. This will usually happen when the child is under a year old. Every cleft is unique, just like every child, so the exact treatment pathway will vary. It may include further surgery to help with issues such as speech and growth of adult teeth. It may also include speech therapy, help with hearing, orthodontic work, etc. The information on this site is intended to be a general guide only, and should never replace the advice you will receive from your local Cleft Team.